Who the Hell is Killing the Pelco Brand??? What a colossal marketing mistake - It looks like Schneider Electric is phasing out the Pelco brand in favor of its own [UPDATE: Schneider denies this, details below]. Perhaps this makes sense in a barbarian sense (to the victor goes the spoils) but this is foolish and damaging for a company struggling to transition to surveillance's new world. Earlier this week, we noticed how a marketing newsletter promoting ASIS 2011 shifted the focus and branding of Pelco products to Scheineder Electric. Today, we saw the Pelco booth which is basically now the Schneider Electric booth. 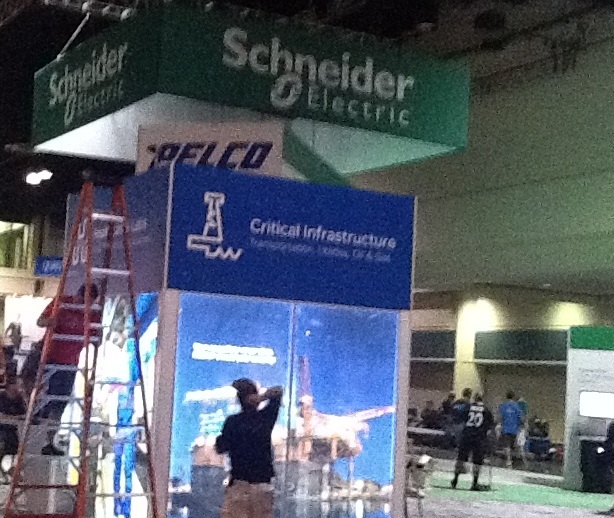 It features a large display for Schneider with a much smaller placard below saying Pelco. This defies common sense. What does Pelco get from branding itself as Scheneider? Loses a brand that people in the industry know and generally respect: This is a company (Pelco) that built trust with a generation of security professionals based on strong customer service and free training classes. Gains a brand that hardly anyone in the industry knows. Ask 100 security managers or installers who Schneider Electric is. I'd be surprised if 20 know the Pelco relationship. Gains a brand with a foreign sounding name - which seems especially counterproductive in Pelco's home market of the US. Gains a brand associated with electronics which is downright bizarre given the fact that _everyone_ is now focusing on IT and networking. Why associate yourself with a previous generation of technology that is now seen as dated and needing to be replaced? Ultimately, people should decide on products based on their quality and performance. To that end, Pelco clearly needs more development of its IP surveillance product portfolio. Nonetheless, why create new barriers and problems for yourself by abandonding one of your most powerful assets - a respected industry brand. Update 9/20/2011: See comment from Schneider below. Also, Scheinder mentioned to us that Pelco was one of the few of more than 100 brands previously existing within the Schenieder product portfolio that was selected as 'assoiated brands' that Schneider wants to retain and use. A common example of this is the awkward 'Pelco by Scheider Electric' phrase used in many Pelco materials. This noted, the clear acceleration of the Schneider brand at the expense of the Pelco brand is unnecessary and unhelpful.